Prep the paperwork – Almost all landlords will require some combination of the following: copies of your photo ID, a letter of employment, your two most recent pay stubs, your most recent tax return. Also, bring along a blank check for the deposit. Bring it with you– The apartment hunt is competitive, so every advantage helps. Bring your paperwork with you when you view apartments. When you find “the one,” you can hand over your paperwork and lock it up quick-fast. Guarantors – Most landlords require that a tenant’s income is 40-45x the monthly rent. If your income isn’t that high, a guarantor (e.g., parent) must co-sign the lease. Have a guarantor in mind ahead of time in the event that you need one to push the application through. 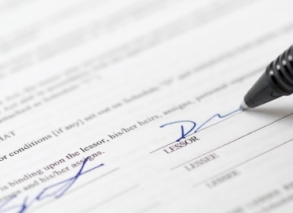 Leases – Before signing a lease, be sure to read it thoroughly. Make sure there aren’t any restrictions in the lease that your broker may not have shared with you. Also, make sure nothing is missing that should be in there (e.g., your right to keep a pet in the apartment). Roommates – If you’re apartment hunting with a roommates, make sure that they are on the lease and have all their documentation lined up, as well. If you thought finding an apartment was a struggle, you are in for a treat, mon frere. Actually sealing the deal is half the battle, and in most cases it involves an infuriating mix of timing, luck, and favoritism. Fortunately, a little preparation and a light sprinkling of gamesmanship can give you the head start you need to nip all those other jokers at the finish line. Prepare your documentation beforehand and bring it with you when you visit apartments to put yourself on the leader board from the word “Go.” Next, make sure that any roommates have their things in order, as well. If anyone is out of town, you will need to fax all of the documents and have them sent back. In some states, these documents may need to be notarized (the same goes for guarantor’s forms, which are discussed below). Finally, try to buddy up with the super and doorman when you visit the apartment—they are on the front line and will know exactly the right time to strike. Gather these essential items below and bring them on apartment hunt outings. Copy of Photo ID – Driver’s license or passport should suffice, even if the picture resembles a celebrity mug shot. Letter of Employment – Must verify employment length, position, and salary. Copies of your Tax Return – Some places require just the past year, others require the past two years, so bring both just to be extra safe. Copy of Previous Lease – Make sure the lease has the previous managing agent’s info and let’s hope there are no skeletons in the closet. If you did have a falling out with your last managing agent, pretend you spent the last few years at the ’rents. Letters of Recommendation – In the absence of written notes, names and phone numbers of personal or business references should be enough. Rental Application and Fee – The application will be provided by either the landlord, broker, or management company. Most often it is filled out on the spot, but occasionally it can be done in advance if there is a particular building or management company to which you are confining your search. The fee (about $50) is used to process the application and run a credit check. Note that if a guarantor is involved, all of the above items will be required from them, as well. Most management companies require that a tenant’s income be above a minimum level, usually about 40-45x the monthly rent (income of roommates can be combined). For a $2,000/mo apartment that means you have to make between $80 and $90K. If you don’t stack this type of money (you’re not alone), you may need a guarantor to co-sign the lease. The guarantor agreement is provided by the landlord or management company and requires some basic personal and financial information. Signing it legally obligates the guarantor (usually a family member or close friend) to pay rent if you default. They must make a greater percentage of the rent, on average 80-90x the monthly rate, but combining the incomes of two guarantors is often allowed. Even if you can hack it alone, having a guarantor is never a bad idea, since it makes your candidacy that much more attractive. On top of the application fee, there will be other lump sums of money to pay either with the application or at the lease signing. Make sure to take pictures of the apartment when you first move in so that you have evidence of that giant crack on the ceiling that the landlord will likely try to deduct from your security deposit. Administrative Fee – Occasionally charged with the application fee to cover other processing expenses (e.g., “background check”) and a new iPod for the landlord’s son. Broker’s Fee – If you go through a real estate agent they will most likely charge a fee. Expect to pay 10-15% of the yearly rent. Learn more about dealing with brokers. Hold Deposit – Used to reserve an apartment prior to lease signing, this deposit is generally just deducted from the security deposit. If the potential tenant changes his mind, it will be deducted from his bank account, instead. Security Deposit – Paid at lease signing or move-in, this charge ensures that damage to the apartment is covered. It is usually equal to one month’s rent and refundable as long as the apartment is left in the condition it was found. Once you have signed, take pictures (with date and time display) of the apartment when you first move in so that you have evidence of that giant crack on the ceiling that the landlord will likely try to deduct from your security deposit. First and Sometimes Last Month’s Rent – Essentially another security deposit and to purchase speakers for the iPod bought with the administrative fee. Pet Payment – Even if the apartment is animal altruistic, they may charge a fee or increase the security deposit. Be prepared to shell out some dough or cute little Fido must go. Often, the security deposit and first/last month’s rent must be on separate certified checks or money orders (no personal checks or credit cards). Don't be the poor sap who doesn't bother to read the lease. At the minimum, it should include tenant’s name, landlord’s name, address, amount for rent, and a pay schedule. Most also contain rules for subletting, pet regulations, who is responsible for repairs, who pays heat and utilities, physical changes that can and can’t be made, and what happens if the lease is broken. If something was verbally promised but is missing or explained differently than it appears in the document, get something in writing or write a provision onto the lease yourself. If the managing agent then signs it, you’re legally golden. Never sign a lease if you’re uncomfortable with any part of it. Finally, make sure to walk through the actual apartment, not a model. Open doors, closets and cabinets, turns faucets on and off, test all appliances and outlets and search for signs of insects or rodents—in short, pretend it’s “CSI: Your Aparment.” Look over these questions to ask before signing a lease. I used http://www.nakedapartments.net and http://www.brokerrevolt.com/ to get no fee apartment listings and I was pretty impressed. If you have the time to look for apartments on your own, I would suggest going to one of the above. I got a Murray HIll apartment on 33rd street and saved literally a few thousands dollars by not using a broker. It was funny cause I saw other people there who were with brokers. Really funny. Good Luck!